About the author: Sara Jacobs recently celebrated her 10th year working at EPA Region 9. She has spent most of her years in the Drinking Water Office, but is currently on a detail to the Superfund Division, working with the Navajo EPA. My two-bedroom flat in San Francisco was built in 1926 and I don’t think much has happened to the kitchen since. We still have no dishwasher or disposal and no flooring other than the sub floor since we ripped up the old stained and cracked vinyl. As we dream of some day being able to take on a kitchen remodel, we wonder how we could minimize the environmental impact of our project. Yet, we still need to stay on budget, maintain product quality, and still display our own unique style. Is this even possible? Vetrazzo uses old glass from traffic lights, windshields, plate glass windows, dinnerware, stemware, laboratory glass, stained glass, and beverage bottles and transforms them into a superior green building material. 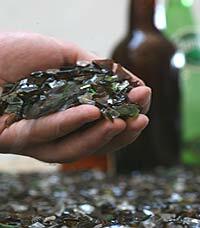 In 2008, Vetrazzo transformed 650 tons of recycled glass into countertops, table tops, bar tops, fireplace hearths, shower surrounds and flooring. 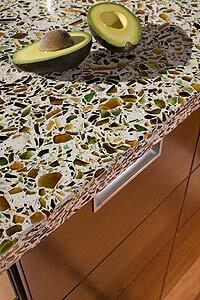 Vetrazzo is made from glass processed directly from the recycler without melting. Since 2007, creation of 11,600 metric tons of carbon dioxide has been avoided by transforming recycled glass into Vetrazzo instead of new bottles or fiberglass. That is the same amount of energy saved by removing 2,125 passenger vehicles from the road for an entire year. So now I have a solution for my counter tops. Does anyone have a suggestion for flooring?